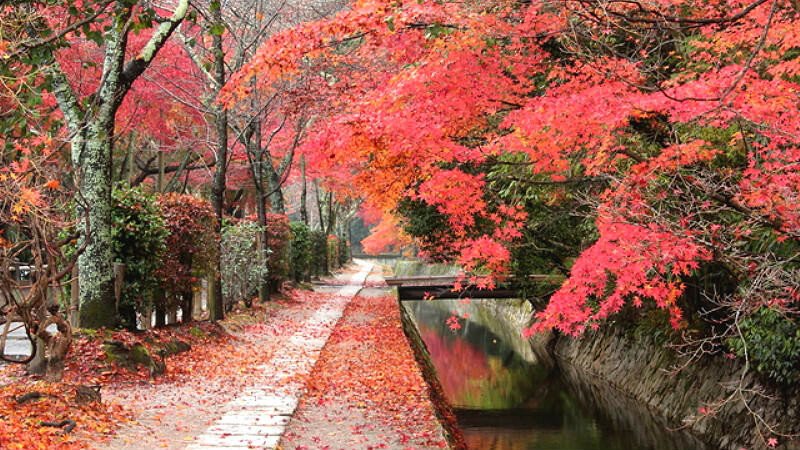 Off-the-beaten-path autumn leaves spots that are still close to the classic sightseeing spots! Unryu-in, a sub-temple of Sennyu-ji, is a 20-minute walk from Tofuku-ji. It is a small temple inside the precincts of Sennyu-ji. 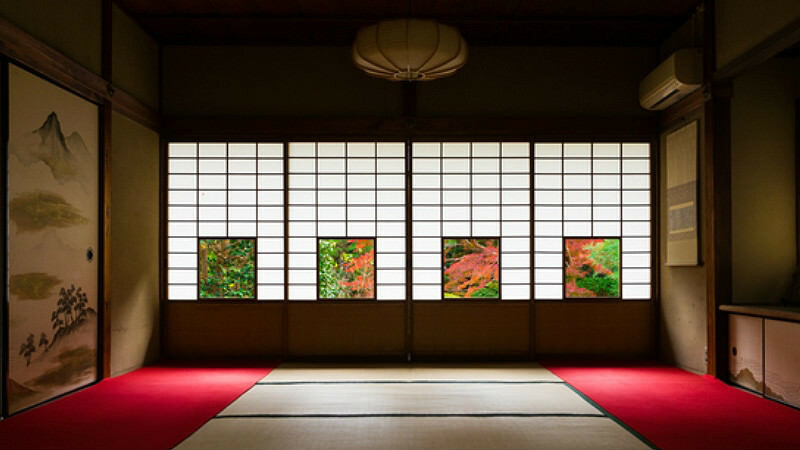 At this temple you can enjoy their garden by seeing it from a round window, or from four square windows on sliding doors. This place is great for those who want to enjoy autumn leaves in peace, because even though the temple is close to Kyoto Station, not that many tourists go to it. Best time for the autumn leaves: Middle of November to the first part of December. 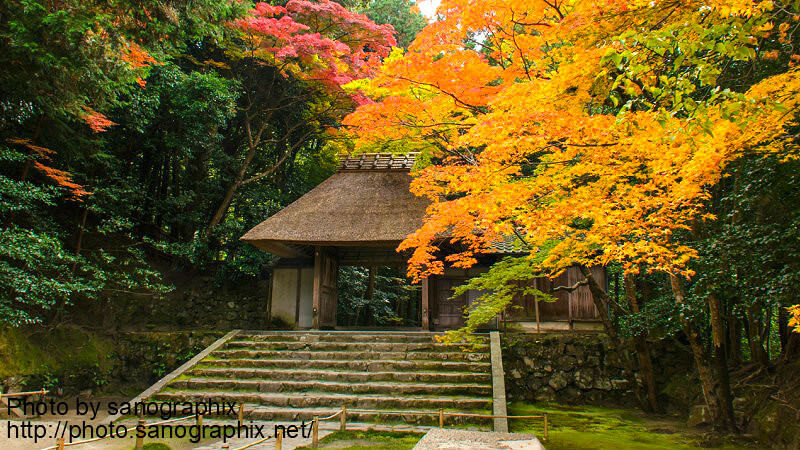 Hogon-in is a sub-temple of the famous Arashiyama sightseeing spot, Tenryu-ji Temple. Normally Hogon-in is not open to the public, but during the cherry blossom and autumn leaves season the temple welcomes everyone to its main building and garden, though you do need to pay an admission fee. Their stroll garden with its rocks, 300 maple trees, and the beautiful moss, all make the garden look incredibly beautiful. The garden is small but the shades of the autumn leaves are rich, and we are sure you are going to leave the temple satisfied. This is a hidden autumn leaves spot in Arashiyama. To get here, you need to take a Randen tram from Arashiyama Station and get off at Rokuoin Station, from where the temple is a 5-minute walk away. The temple is located in a quiet residential area, and after you go through the temple’s main gate you get to see a narrow path to the temple lined with maple trees. This little temple is usually not featured on guidebooks, and if you go to it on a weekday morning, you stand a chance of getting the whole temple to yourself. Besides the main path to the temple, the dry rock garden which incorporates the mountains of Arashiyama into its design is also worth a see. Honen-in is some way from Philosopher’s Path, right by the World Heritage Site of Ginkaku-ji. It may not be as big and stately as some bigger temples, but the moss-covered thatched roof of its gate has a nice, rustic feeling to it. After you go through the gate, you get to see the white piles of sand known as Byakusadan and the beautiful red and yellow autumn leaves together. After the autumn leaves start falling down, they pile on the white sand making the temple feel melancholic but beautiful. Eikan-do and Ginkaku-ji are also close, but Honen-in is not crowded, which is why we recommend it. The Philosopher’s Walk may be more famous for cherry blossoms, but it is also very beautiful when it’s covered by vivid autumn leaves. 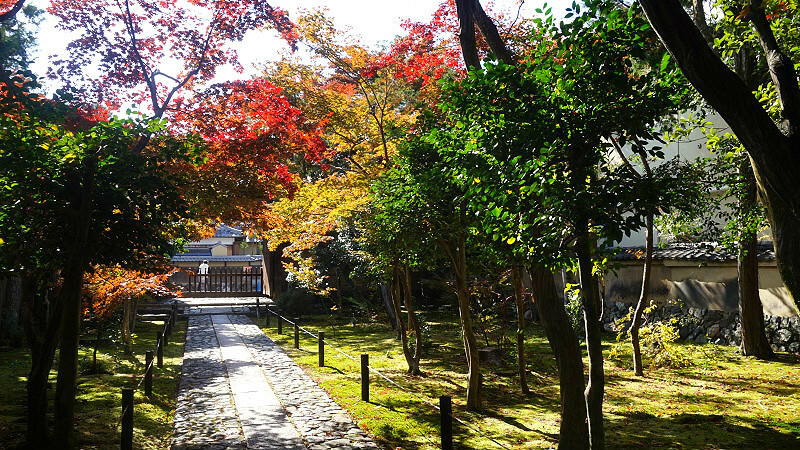 Many sightseeing spots are easily accessible from this path, like Eikan-do, Nanzen-ji, and Ginkaku-ji, so how about enjoying the autumn of Kyoto while you think of the meaning of life on the Philosopher’s Walk? Entoku-in is a sub-temple of the famous Kodai-ji in the Higashiyama area, and the temple has two dry rock gardens, Nantei and Hokutei, and at the temple you can sit down and look at the beautiful gardens and the autumn leaves. They also sell a ticket for which you can go to both Entoku-in and Kodai-ji, which you should get if you go to both of them. There is also an illumination even at night at the temple which paints the garden and the autumn leaves in a mysterious light. All of the places here are close to famous sightseeing spots, but still not overrun by tourists. These spots are great for those who have been to all of the famous autumn leaves spots, or for those who want to avoid the crowds. Of course, because these spots are close to the famous ones, you could go to both of them. 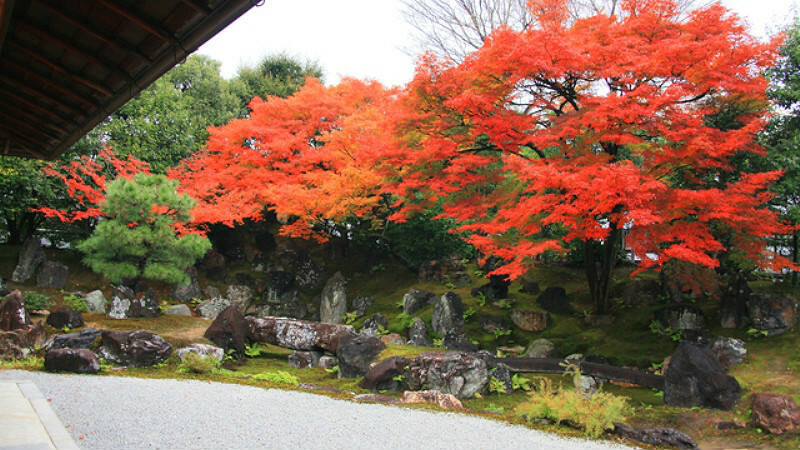 Part 1Classic autumn leaves spot under 30-minutes train ride away from Kyoto Station! Part 3Off-the-beaten-path autumn leaves spots that are still close to the classic sightseeing spots! 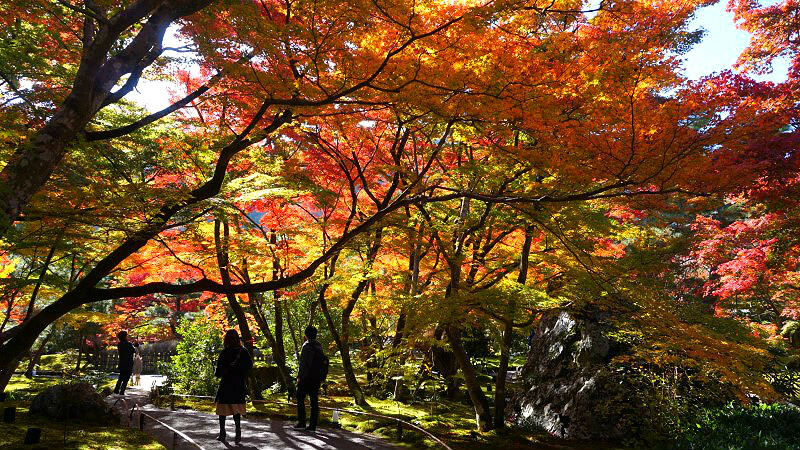 Part 4Enjoy autumn leaves in places surrounded by nature over an hour’s trip from Kyoto Station!